Choose File > New Project (Ctrl-Shift-N). Under Categories, select NetBeans Plug-in Modules. Under projects, select Module Suite Project and click Next. 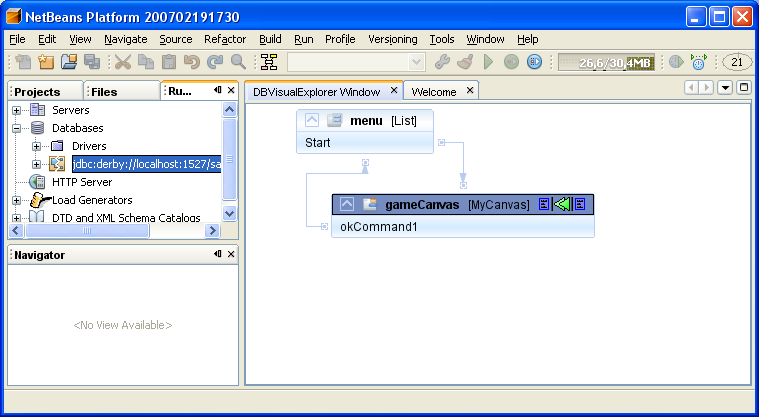 In the Name and Location panel, type "DBVisualExplorer" in Project Name. Change the Project Location to any directory on your computer, such as c:\mymodules. Click Finish. use File -> New Project -> NetBeans Plug-in Modules -> Library Wrapper Module Project to launch the wizard. Choose File > New Project (Ctrl-Shift-N) again. Under Categories, select NetBeans Plug-in Modules. Under projects, select Module Project and click Next. In the Name and Location panel, type VisualExplorer in Project Name. The default in the wizard should be to create the module underneath the directory where you just created the suite, which is fine. Click Next. Implementation Version means that we use the whole library, not just the public part. Normally you wouldn't do that, because the non public part of the library might change and this would break our code. Unfortunately the part of the API we need is not (yet?) public. So for the scope of a tutorial we will just ignore that rule. You will see a grayed out icon in the toolbar. If you go to the Runtime tab and click on a connection, the Toolbar button will be activated. Everything up to now was boilerplate code, things you probably have done before, or will do like this or similar a lot of times when developing NetBeans modules. Now for the fun part! We will use the Visual Library to create a GraphScene that we can use later on to display the DatabaseStructure. First we will use one of David Kaspar's cool examples to get started and create a scene. Then we will get a view from the scene and add it to our TopComponent. Now we can create our Scene. We will base ours on VMDGraphScene. Beautiful, isn't it? We have linked the TopComponent to our DBGraphScene. In the next section we'll use this mechanism to add real data. The createSceneFromConnection method gets the DatabaseMetadata ( jdbcConnection.getMetaData() ) from the Connection. 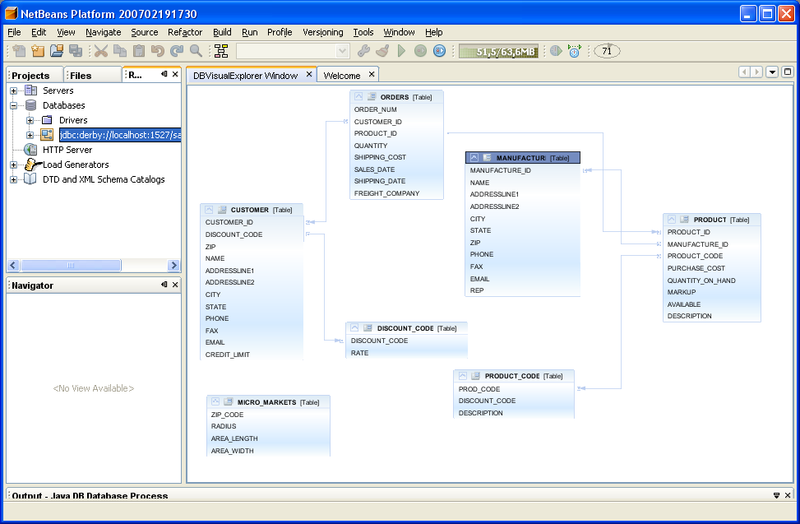 With the subsequent calls to getTables table structure is retrieved and the nodes of the graph are created. For every table getColumns is called and a Pin is added for every column to the table node. These pins can be used in the next step to create a connection between two tables. Now we iterate through the tables and call getExportedKeys to get hold of the ForeignKeys. For every exported key an edge is created between the pins of the related columns. The moveTo method does the animation, when the window is opened. We could enhance that with a nice graph layout algorithm ( I beautified the layout for the screenshot manually, but as far as I know David is working on a orthogonal layout, so this might be there out of the box quite soon also). This page was last modified on 29 October 2012, at 21:02.